Chapter Book Challenge: Fourth & Final Week of the Chapter Book Challenge Starts Now! Fourth & Final Week of the Chapter Book Challenge Starts Now! Just days left to go until our chapter books are supposed to be finished. We should be almost ready to wrap up the writing on our first draft, so that we can turn to editing and cleaning our manuscripts up after this month ends. How are you doing with the challenge? Have you, as I have, fallen behind? Are you planning to fit in a lot of writing time in this last week? Or are you almost finshed and planning to begin your editing in this last week? Wherever you are in the process, let us know in the comments. There is now a selection of products with the challenges logo on them. I still need to go in and clean up some of the products by making sure that the logo fits correctly, and I will have it all looking good a few days from now, but the mugs and t-shirts should all be looking good already. Melissa Gijsbers Khalinsky from the Chapter Book Challenge Facebook group mentioned her 10 year old son giggling as he read her manuscript, and it got me to thinking about my own manuscript. I don't know why I haven't had my 9 year old read it yet. I am working on three different stories and dividing my time between them because I can't decide which one I want to work on more. Melissa gave me the idea that I should have my daughter read them and tell me which one she enjoys the most of the three. Then I could focus on that one first. 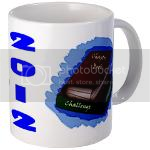 The prize for this week is an official Chapter Book Challenge 2012 mug. All you need to do to be entered into the drawing to win this book is to be officially signed up to the Chapter Book Challenge and to comment on this post, letting me know how you are doing in the challenge so far. The winner will be chosen by a random drawing. It's time to announce the winner of last week's prize, selected by random drawing. 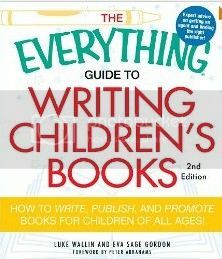 Last week's prize was the "The Everything Guide to Writing Children's Books: How to Write, Publish, and Promote Books for Children of All Ages!" by Peter Abrahams. And the winner of last week's prize is: Rena J. Traxel! Rena e-mail me your mailing address so I can send this out to you. I am on chapter four and have outlined my ch book to be ten chapters. I am a bit behind but plan to get more done this week. Thank you for hosting this challenge. I enjoy the facebook group and hope that continues beyond the challenge. This prize would fit perfectly in with my collection of mugs received while in ece classrooms. I fall into the category of don't know if I'll make it. Like Kelly, I'll have to pull some all-nighters if I am to get it all done. Oh, but the editing that'll follow! Yet, I am so excited about this challenge and this group! The level of support, the feeling of community, and the generosity of everyone. I love it!